The Gulf of Maine Council’s Climate Network has assembled resources useful to municipalities in their work on climate mitigation and adaptation. 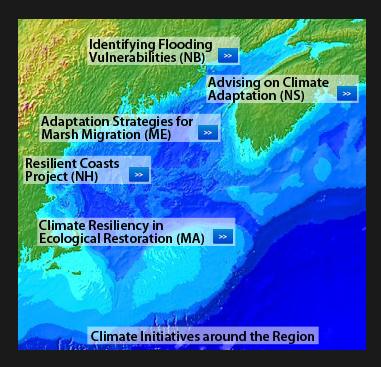 In addition to the resources here, visit the NExUS database (www.neclimateus.org) to do geographic or topical searches of climate-related studies, adaptation plans and action plans from the Gulf of Maine region and beyond. A fact sheet with more details about NExUS is available here (PDF, < 1 mb). NOAA’s Coastal Climate Adaptation website has a variety of guidebooks available for download as well as outreach materials related to coastal climate change adaptation. NOAA’s Regional Climate Services Directors (RCSD), Eastern Region page, which has information on regional partnerships, datasets and tools to support decision-making. Climate Adaptation Knowledge Exchange has an extensive library containing case studies, adaptation plans and strategies and reports relevant to climate change adaptation. The Georgetown Climate Center has an adaption clearinghouse that provides federal state and local policy information on a number of impacts areas and sectors.StormSmart Coasts has tools and resources for coastal communities to address current and future storm and flooding threats. StormSmart Properties provides effective means to reduce erosion while minimizing impacts to shoreline systems. Creating Resilient Water Utilities has a variety of information and tools to help those in the drinking water, wastewater, and stormwater fields to adapt to climate change. ICLEI’s Climate Resilient Communities Program has a guidebook called Preparing for Climate Change: A Guidebook for Local, Regional and State Governments as well as a tool called the Adaptation Database and Planning Tool (ADAPT) that will take you through the whole process. The Northeastern Regional Association of Coastal Ocean Observing Systems (NERACOOS) provides real-time and historical ocean and atmospheric conditions and a tool for looking at conditions relative to climatological expectations. NOAA’s Sea-Level Rise Viewer (US only) offers the capacity to depict potential future sea levels along coastlines, providing a zoom function to center in on targeted areas and a slider to illustrate inundation with 1-, 3- and 6-foot increases in sea level. New Hampshire’s Coastal Viewer (NH only): This tool provides Seacoast New Hampshire communities with data to help visualize areas most vulnerable to coastal hazards. See for more details. 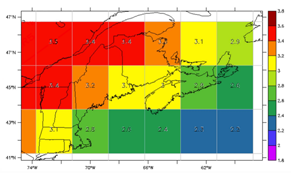 Maine Geological Survey Potential Hurricane Inundation Map (Maine only) shows mean and high tide inundation extent for Category 1 through 4 hurricanes. New Brunswick Climate Futures offers maps and explanatory text to explore potential climate changes up to the year 2100. The University of Maine’s Climate Change Institute provides a “Climate Reanalyzer” provides perspective on climate and weather changes since the late 1800s, and offers ways to compare current weather against long-term averages. For more guidance and planning documents involving climate change adaptation in the Gulf of Maine region, please search NOAA’s NExUS database by topic or region.